The Icom 7300 microphone that’s included with the radio gets great audio reports, but I can’t use a hand mic while contesting or running a net. When I first received my Icom 7300 I ordered a Heil Y cable with blocking capacitor so I could continue using my dynamic microphones. They weren’t real expensive mics, but I wanted to use what I had. Others purchasing the 7300 did the same thing. Mine were acceptable and sounded good, but I just couldn’t get my VOX to work right. It worked, but the VOX gain had to be set near max and it was still inconsistent. Speaking for myself, in retrospect I should have broke down and purchased a new electret condenser mic instead of spending money on the cable with blocking capacitor, but looking on the bright side, I probably would have spent too much on the new mics. You see, I was considering a couple of Heil microphones, an Icom desk mic and and another more expensive brand. All good possibilities and all excellent microphones. Well worth the money, but more than I wanted to spend. Wanting to save a buck or two I looked for the best deals while not sacrificing on audio quality. I purchased a Yamaha CM500 for a headset. 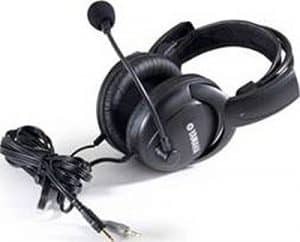 This is a well known headset with the Flex radios and I have heard good things about it with the Icom 7300. I wasn’t disappointed. It’s comfortable, pretty light and receive audio sounds good. I would say transmit audio is excellent. It’s got a hot mic and activates the VOX like a mic should on the 7300. See more ham reviews at eHam. UPDATE: A friend, WB0OAF, just sent me a audio recording (k0pir-yamaha-cm500) of the Icom 7300 while I ‘m using the Yamaha CM500 headset. Settings: Mic Gain 40%, COMP 2, TX Bass -1, TX Treble +3, TBW Narrow 300-2500. And just recently, WA0OAF, told me about the BM800. ( There are many flavors of this mic around. Andy got his off Amazon and I got mine off E-Bay). He was using one with his Icom 7600 and it sounded great. After looking into it and finding the best deal I could, I purchased one off of E-bay. Again, not disappointed and I have already received a few good unsolicited compliments on audio. People have been asking me where I purchased it. These are inexpensive electret mics. The BM800 is not as hot as the CM500, but it doesn’t require 48v like the spec sheet shows and the Icom 7300 is supplying it with 8v just FB. So far I really like this mic. It doesn’t look or feel cheaply made. UPDATE: WB0OAF made a recording of me on the BM800. My Icom settings were Treble +4, Bass -1, Mic Gain 40%, COMP 4, TBW Narrow. Click below. I had to replace my Y cable with blocking capacitor, so I got a replacement off of E bay. It’s a 8 Pin MIC/Headset Adapter HS-01C for ICOM and works very well. There is no need for the additional phantom power supply with these BM800 mics. The Icom radios provide the needed power through the mic jack. Here’s a very good article on compression by G0GSF and AB4OJ. As I said, the Heil mics are excellent microphones and well worth the money. Who knows how long these low cost mics will last. 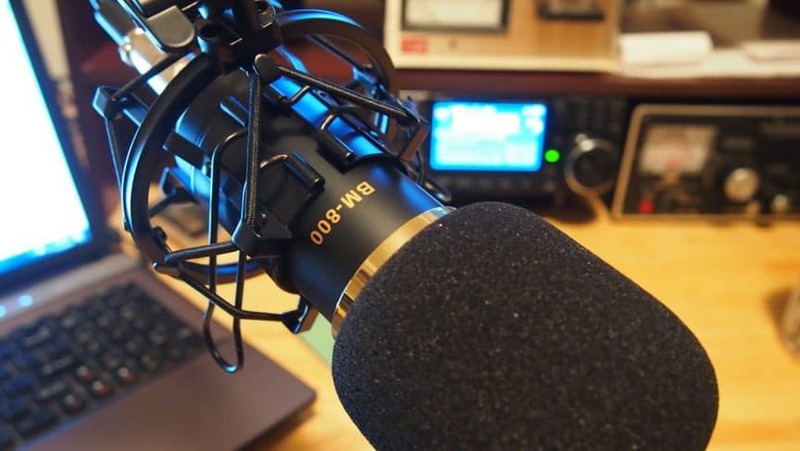 I used a Heil BM-10 for years with my Kenwood 570 and Icom 7000, always getting great audio reports. I still have it today using it portable and I will probably never get rid of it. Am I happy with the new microphones? Yes! The Icom 7300 VOX works fine with both mics. How do the new microphones sound? You be the judge. I’m on the Breakfast club net every Thursday morning at 6:00 AM CST and every Saturday morning 5:00 AM CST. Come and listen and of course check-in with me. 3.973 MHz. 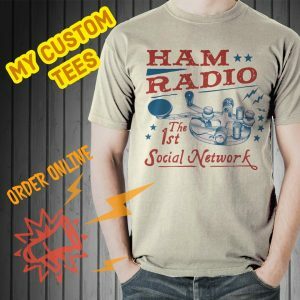 Ham Nation 237: Do you want a condenser microphone? I used a Heil BM-10 with HC5 for a while and it required more gain and comp like you said. It was okay though. The Yamaha works very well and is a hot mic. Currently I am using a Heil adapter with it. The AD-1-iC. I have a small stereo to mono adapter in line. It connects to the mic on the AD-1-iC. You can find it here. The other y cable I used was one I got on E-bay. You can find it here. Thanks for the info. I have that ad-1-iC adapter already (bought by mistake) so that is good. Okay Scott, hope to hear you on the air! 73! Question re Headsets. Trying to use an older Heil Proset with a HC5 element. Works, but running gain and compression full bore to get any real audio out and the VOX is sketchy. I do use a foot switch as well which helps. The Yamaha might be a better solution. Was wondering what cable is needed to connect it to the radio? I have the HC5 proset adapter and I also incorrectly had purchased an AD-1-iC adapter cable from Heil. Hi Rich, received the CH500 and the adapter cable yesterday, man is this mic hot and the setting show it mic gain at 30%, comp at 3, moni at 15%, TX bass at -2, TX treble at-2, RX bass +1, RX treble +1, a complete opposite from the Heil Pro set 6. So far most seem to like it but if pile up busting is your only game the Proset 6 is slightly better but overall audio the Yamaha is more pleasing. Its hard to find a really good all around Boom set and that’s why I have both but on recording back to me from other stations the Heil sounds pinched. Hope this helps. Glad to know it’s working for you. That is about what my settings are using it. 30% mic gain and COMP at 3, but I am using a little more treble (+3). Maybe I should look at decreasing it. I have tried a few different TBW settings and one you could look at is 300 Hz to 2700 Hz. You might like it. Thanks for the information and have a great time with it. I am sure that rig will keep you happy for a long time, I noticed you live in DS my mother when she was very young grew up as a girl in Fargo, way way way before any movie, back in the early 1900’s. One day I hope in a few years my wife and I will end up on the west coast of Florida and buy a tow type camper RV and travel the states and that little 7300 will be going along for the ride. I just ordered the two different adapter cables one for the Icom and the other for the Yaesu plus the Yamaha CM500, I will compare them to the Pro set 6 Heil set and let you know. The ProSet 6 on the Yaesu can be set up for real DX meat grinding audio but I have a feeling on the Icom the mic stage runs a little to short of the right amount of gain so the condenser mic element will drive the dickens out of the Icom and I will do comparo’s. After I get them here and set up maybe will set up a call on 20m and you can see for yourself. The Heil headphone part of the Pro set has been improved over the years from the original, far better audio on RX but I feel the mic element is not as good as the old HC5 that why my comment on why I think Heil is going to china for his lower price pro sets which at $150 are not cheap. I would love a 7610 but I will slowly wait for the backlog orders on the plain jane Flex 6400’s to be delivered and pic one of those up, at $2k its a decent TRX and besides I mainly use point and click mostly with my two radio’s now so its no big deal not to have knobs anymore. Hi Rich, well if I had the extra cash I would have a 7610 but I also like having a backup rig since I bought the 7300 and to be honest for most of my operating it would suffice but the only contesting I really have always liked or at one time was addicted to them were the DX contests, just look at the bottom of my QRZ page of the antennas I had up in the mid 1990ies on a suburban back yard 1/3rd acre plot here on LI but that was in a galaxy long ago and far away before I got re married again, lol. The stories and fun I had with a group of close ham buddies was total radio fun with even the visits by Mr Murphy during the middle of the night and a 40 meter beam boom to mast clamp broke and it was holding on by the RG213 coax so we climbed the tower and roped the boom to the top of the tower pointed NE for the rest of the weekend. I would hope that Icom would expand there line up of radio’s and I feel that they dont really need the 7851 type radio any more but I do know they look at these blogs from users today so you never know what will be next. Hell they not going to design a radio just for me but I feel many of use would like something in between. When you look at the design of the 7610 it has as much going on inside that radio as the 7851 on the RX side, two independent RX with separate Digi select front ends so with a classic tri band antenna you can really look at 10m real time while running station on 15m without the RX sensitivity dropping by much at all which is true dual band RX. The SO2R stuff is way overrated plus being proficient enough to be able to make your brain/ears to do it well takes time and to be honest your best to be able to concentrate on the band you are on and just use the second RX for a look see if a higher band does open. I have severely down graded as far as my antennas at my qth but have learned to work with allot less and still have FUN which is what it should be. I am looking at e bay for the Yamaha’s CM 500’s and will order the adapter for them as well. If I do send up selling the FTDX3000 and go with the basic Flex 6400 I’ll keep the Heil Pro set 6 for either use with the Yaesu or Flex but at a later date I want to try the BM800 mic, there seems to be so many sources for them on e bay plus different packages between $25-$35 for complete systems w/adjustable deck mounts. Thanks for commenting and it’s nice to hear from you. Yeah, I think the 7610 has a lot going for it and it’s just under the 7851. The 7851 is so much more $$$. I looked at the Flex 6400M/6600M and they have the Icom 7610 beat on the LCD touchscreen and monitor as far as resolution goes. After using the 7610 with an external monitor for a while, I have almost abandoned it. I still turn it on occasionally. It’s okay and I know some Hams really like it, but for me it’s just not that impressive. The Flex will win that battle hands down, hi hi. I agree, SO2R seems a bit much for me. If I were an avid contester, then maybe I could learn to use it effectively, and that’s a big maybe, hi. Using the 2nd RX as you mention is fine and works well. I’m doing it today and while operating on 20 meters, I saw 15 meters open. Good use of the 2nd RX. I am thinking of the Pro set 6 for myself. I’ve heard them on the air. My problem is my ears and it’s hard to find a comfortable set. The Yamaha is okay as far as comfort and I can’t complain because it’s so inexpensive. Thanks for the valuable comment and thank you for visiting my website. I am hoping the 7610 gives me years of enjoyable operation and of course, something to write about! Thank Rich, I think I will try the Yamaha CM500 and I will order up the HS-01C adapter cable for use on the Icom 7300, may try that BM800 mic as well cause I have seen some great packages when bundled with shock mount, foam wind screen, pop filter, adjustable desk stand for around $35 not to shabby. I have a 781 on my FTDX3000 but may be selling that radio and trying the new Flex 6400 and will keep that mic with that radio set up. I have watched all your reviews on the 7610, would love to get one of those but its a little higher priced right now for my retired pockets so the no knob basic Flex will have to replace the 3000 but that Icom is nice. I am just soo amazed how well the 7300 works and if they made a model between the 7300 and the 7610 with some upgrades I would be in but I have a feeling they will only make one higher end model above the 7610. Would love to see an Icom SDR radio with an in band dual watch, digi select pre selector, adjustable step attenuator( but the RF gain control on the 7300 works about the same) slightly larger display, maybe just a few more controls on the front panel, better rear panel connectivity(like 2 antenna ports or configure one of the two for RX only like Yaesu does, HDMI or some kind of video) and a price range around $2k or somewhere between the 7300 and the 7610. They would hit it out of the park! Enjoyed all your video’s and enjoy those Icom’s at your station. Thank you and great to read your comments. The 7610 is a very nice radio and I’m very happy with it. It is pricey though. It was a tough decision for me. Ham Radio is an exciting hobby and I enjoy it so much. It’s nice to hear from you and I hope we catch each other on the air. This weekend the NAQP, hope to hear you on! Hi Rich, have a 7300 here and use a Heil 6 Boom/headset but I have to drive the snoot out of the mic gain and possessor to get any output and I am using the IC adapter from Heil as well. The boomset works fine on my Yaesu FTDX3000 but I would like to get a little more audio out of the 7300 so I am looking at the Yamaha CM500 boom/headset combo to use with the 7300. What adapter would I need to use the CM500’s with the 7300 cause I would really like a hot mic on this radio. I have been using Heil for years but to be honest have been not as satisfied with his newer headsets or boomsets, very pricey for something that is more than likely made in china with there name on it, I get the feeling its become a label and not the quality they once produced. Great question and I ran into the same thing. I couldn’t get VOX to work very well with the Heil dynamic mic, so I went with the Yamaha CM500 and the BM800 boom mic. I used this y cable that I got off of E-Bay. 8 Pin MIC/Headset Adapter HS-01C for ICOM, it’s sold by K6VHF. Thank you for visiting my website and best 73! I purchased a similar adaptor from an Ebay Online Store called TechnoFix UK that allows you to connect PC Microphones to your 7300/7610. Are you able to tell me if this can be used with the Yamaha CM500 headset? If this is unsuitable I will purchase the one mentioned in the above comments. Nice to hear from you and thank you for commenting and the question. That looks like a very nice adapter and yes the Yamaha should work without issue. They show a BM800 and inexpensive headset and I also use a BM800, so it doesn’t look like you’ll need anything else. Thanks and best to you and yours. Hi Rich, Your website is awesome! I asked Santa for a BM-800 for Christmas. I installed it this am and have received many un solicitaed audio reports using your recommend settings on the “mid” profile. This is a great microphone if your looking for something that is not the Big price of th Heil and still has th great results. I also have been using my Yamaha CM-500 and this is a great Headset/Microphone setup! Again, thanks for taking the time to create such a helpful and informative webpage!! Merry Christmas and HNY! I’m glad it’s working for you. A friend told me about the BM800 and I’m happy to pass it along. I use mine on the Icom 7300 and love it. It doesn’t look or feel cheap, but cost way less than others. Thanks for commenting and thank you for visiting the website. Thanks for coming by my website and thanks for commenting. I use this HS 01 C Mic Adapter I got off E-bay. Very reasonable. It’s sold by K6VHF. Thanks for asking and I’m still using both those mics today. I get positive comments regularly on the audio. Thanks Rich – great answer! Since you mentioned using the Monitor – I have tried that and had miserable results. Can you outline how you use it successfully? – I didn’t use headphones – is that the trick? I got a squeal that scared me and i gave up. You nailed it. Use a headset and it’ll work FB. I went through my TBW settings today and made a minor adjustment from the default setting. It’s still very hard for me to tell a difference in subtle changes using the monitor, but my hearing isn’t all that great anyway. It takes a QSO with someone who knows or better yet, have some record your transmission and send it to you. I am investigating mic’s to use with the 7300. In the course of doing my reading, besides reading about mic gain and compression settings, I read that some say “for DX, use a narrow bandwidth” whereas another says “Narrow setting does not work well for DX”. Problem is, I can’t figure how to “set:” the bandwidth they’re talking about. I see under Tone Control that there are SSB TBW (transmit band width??) of Wide, Mid, and Narrow. But I don’t see any way to choose one of these and make it “stick” or be in action. Can you tell me what I’m missing here?? Nice to see you on here. That’s a great question! You change the TBW (transmit band width) by pushing the “FUNCTION” button on the front of the radio. The menu that pops up will show your TBW. Just touch the softkey (softbutton) on the LCD to cycle through the options. WIDE, MID, NAR. To change the TBW settings (Hz) go to MENU>SET>Tone Control. Push Tone Control and go to TX. Then touch SSB. You’ll see you can change the settings (Hz) for WIDE, MID and NAR from there. I just use WIDE most of the time. This stuff can be found on page 4-14 and 12-3 of the full manual. Everyone’s voice is a little different, but generally the narrow works good for DX and the wide for rag chewing. I played around with mine and using the Monitor with a headset, have it where I like it. The default WIDE is good for me. I hope this helps you. Let me know. Great Info!! thanks. One question. You put directly BM800 to IC7300 (1) mic pin and (7) Gnd pin?? or use +8v to feed BM800?. Dear Rick, I followed your recommendation to get a BM400 micro and tried to connect it as it came from the factory, with the 8 pin connector of the IC7300, the 1 to In the Mic and the 7 to micro gnd, without feeding by pin 2. But it does not work for me, you could check the connection of your “Y cable”, thank you very much and happy Christmas. It’s a Google translation, sorry for the inconvenience. The BM800 requires DC bias. That is probably the issue you are having. I don’t have the pin out, but it is on the Internet. Merry Christmas and let us know how it goes. The Yamaha is easy and just takes a Y cable if you want to use a simple foot switch. The BM800 will use the same Y cable. I didn’t provide a link to the foot switch in the post, but there are many choices on E-bay. Personally I still use and old Heil foot switch I bought years ago. It still works okay. The boom mount to hold the BM800 is just and inexpensive one from Amazon. I hope to upgrade soon to a Heil or studier one. Mine is a little touchy.